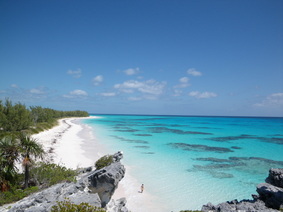 Lighthouse beach is the most beautiful beach on the island, if not all of the Bahamas. It is more than just a beautiful beach, it also has incredible cliffs and rock formations around lighthouse point plus its namesake, the old lighthouse itself. To the east of the point is lighthouse beach proper and to the west is lighthouse bay. The water here is crystal clear and the snorkeling is spectacular. There is a strong tidal current around the rocks off the tip of lighthouse point so snorkeling around the rocks is not recommended. It will take you about 2 hours to get from Governors Harbor to Lighthouse Beach so you will want to leave early and make a full day of it because believe me you will not want to leave once you get there. Make sure to bring your camera, snorkeling gear, food, and lots of water and sunblock. Rock Sound will be your last opportunity to get, groceries, gas, take-a-way and other supplies so make sure to stop here if you need something. The road to Lighthouse Beach is a long and bumpy one and it should not be attempted if you are not comfortable with the dirt/sand roads of the island. It is highly recommended you take a vehicle with good tires and high clearance. If you have lots of experience driving on unmaintained roads you may be able to make it with a sedan or minivan, if you are very very careful. To get to Lighthouse Beach head south past Rock Sound. Soon you will reach Greencastle, at the center of town is an intersection with numerous signs, take a left here and follow the sign pointing to Bannerman Town. Keep following main highway straight toward Bannerman Town, after about 11 miles you will reach a fork where it looks like the main highway curves to the right toward Millars, just keep going straight. The road will narrow and turn to a rough sand track; you are now on what will feel like the longest three miles ever. The road will begin to get worse and worse, just keep on going, about 2/3 of the way in you will pass a smelly pond on the left, this means you have less than a mile to go. After what felt like the longest roughest three mile drive ever, the road will turn to the left and you will get a glimpse of Lighthouse Bay on the right. Keep going another quarter mile till the road turns left again and heads up a steep sandy hill. Park here, do not attempt to drive up the hill!! The old lighthouse is up on the rocks in front of you and if you walk up the sandy hill you will get to the famous Lighthouse Beach.